Just east of the point where Wansdyke crosses the Lockeridge-Alton Barnes road lies the former village of Shaw. 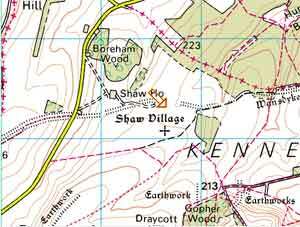 The Wansdyke Path makes a detour here, around the privately owned lands around Shaw House, but there is a permissive path to the site. Shaw has been proposed as contemporary with the construction of Wansdyke. (all crossroads, etc. carry a link to UK Streetmap.co.uk). By car from Swindon. Follow the A 346 to Marlborough, then the A 4 to Avebury. At Fyfield, take the minor road left to Lockeridge and Alton Barnes. After passing a wood to your left, you'll cross Wansdyke at Shaw House, but the bank is completely overgrown and not much'll be visible. You can park here, but be careful for the road is narrow A better alternative is to continue on to the small parking just before the crest and the descent to Alton Barnes. (Warning, it may be closed!) The Wansdyke Path moves off east about 500m below South Lodge, and about 1.5 kms will take you to Shaw. By car from Calne and Chippenham. Follow the A 4 to Avebury and Marlborough. At Fyfield take the road to Alton Barnes, then continue as described above. By car from Marlborough. Follow the A 4 towards Avebury. At Fyfield, take the minor road left to Lockeridge and Alton Barnes, then continue as described above. By car from Devizes. On leaving Devizes take the road right to Horton and Alton Barnes. There take the road to Lockeridge and Marlborough, but when you rached the top of the steep climb, park the car at a little parking, then continue as described above. Wansdyke may be quite hard to trace here, but as it is the only section where it actually runs through dense woodland, it may be interesting to visit and seek it out. At Daffy Copse, Wansdyke makes a very atypical right turn, immediately followed by a left turn. Though it has been supposed this wast because of the geography, my own favorite explanation is that of two teams nearly missing each other! By car from Swindon. Follow the A 346 to Marlborough, then the A 4 to Avebury. After you passed Manton, take the first road left, and continue south through a small valley (Clatford Bottom). Take the fourth path right, and continue on foot along Wansdyke Path to Daffy Copse. You can follow the path further west if you like, it emerges from the woods just before the village of Shaw. 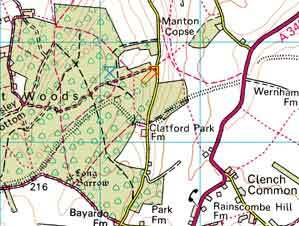 Alternatively, drive a little further up Clatford Bottom, and beyond the wood you'll cross the line of Wansdyke. By car from Marlborough. Follow the A 345 to Pewsey. After the second cottage to your right you'll pass Wansdyke on the right side. You can try to park here and follow the footpath to Clatford Bottom and beyond. Alternatively, drive a little further to Speck Cottage, where another footpath leads to Clatford Bottom. Alternatively, drive a little further and take the first minor road to the right, and at the next crossing (Bayardo Farm) either go right into Clatford Bottom, or park and continue on foot along the south edge of West Woods. You'll pass a long barrow before reaching Wansdyke at its point of entering West Woods. By car from Calne and Chippenham. Follow the A 4 to Avebury and Marlborough, then continue as described above. By car from Devizes. Take the A 342 and then the A 345 to Pewsey, and continue to Marlborough. After reaching the top of the Downs (to your right is Martinsell, the largest hillfort around), take the first minor road left, and at the next to the right, and at the next crossing (Bayardo Farm) either go right into Clatford Bottom, or park and continue on foot along the south edge of West Woods. You'll pass a long barrow before reaching Wansdyke at its point of entering West Woods. click here to return to East Wansdyke, section 10. VortigernStudies and Wansdyke Project 21 are copyright � Robert Vermaat 1999-2002.